The first model I will cover is the Bearded Gnome, of which I have two! 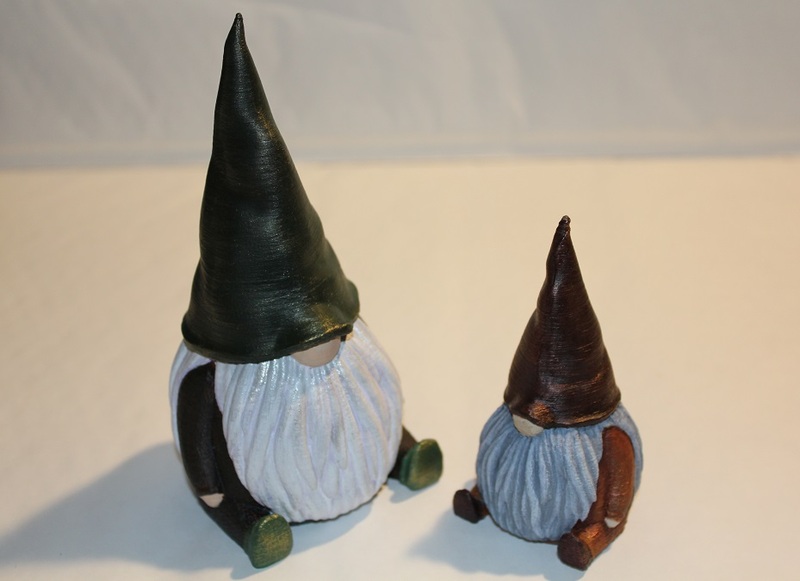 I have two because the model can either be printed all in one (brown one), or it can be printed in two parts so that the hollow gnome becomes a vessel with a secret compartment under his removable hat (green one). These gnomes are really cute, and they have some great texture on their bodies which lends itself well to being painted. The beards can be a bit challenging to shade, but a simple wash with a dry brushed highlight on top is an easy way around it. I primed both of the models with some thinned out acrylic paint (brushed on) and then when that was dry (usually I wait at least over night) I roughly blocked in the base colors. Next I applied washes to the beards to get into all of the crevaces. I used a violet wash on the large gnome and a dark grey wash on the small gnome. When the washes were dried I applied a second wash to tidy up the first and add more depth in some places. Then I highlighted them all over with a dry brush in their corresponding colors. After the highlights were on, I did the thing I do with some additional metallic highlights, because I like the way it catches the light and makes the model more interesting. When all of that was dry, I went back over the bodies and beards of the gnomes deepening the shadows with dark washes and tidying the edges. Click any photos in the gallery below to see larger pictures of the gnomes from various angles. The next model I’ll cover is The Fallen Warrior. You can download him Here, and view a great timelapse of the first Fallen Warrior being printed by his creator Here. I wanted to put my stylus in it, but couldn’t find the damn thing (why it needs a holder), so for now he’s been impaled with one of my paintbrushes, which seems oddly appropriate. Anyway, there IS an ornate spear that is available with the STL to impale him with as well, but we didn’t print that part as I was too keen to just get started on the main event. This model has SO MUCH surface area!!! Not a bad thing, but it does make painting it with a brush a longer process than I’d originally anticipated. He was primed with thinned off-white acrylic and allowed to dry overnight. Next I painted the stone parts with grey as a base color. The sword blade was painted silver and the sword hilt as well as the shield was painted bright copper. Then I let all of that dry completely. After the wash was dried it was time for highlights. The stone has two layers of dry brushed highlights, one in burnt sienna and another with a mix of burnt sienna and white on top of that… which makes a total of four colors in the stone. The skeleton has some off white highlights that I added in areas where I got a bit overzealous with the brown wash. 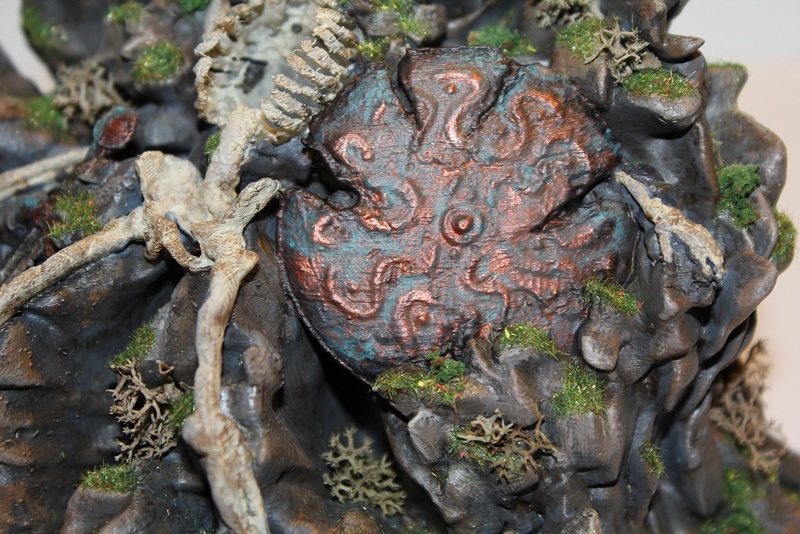 I Google image searched “oxidized copper” to give me an idea of how I could further tarnish the sword and shield. I mixed the green/blue I needed and applied it to the weapons carefully and sporadically. The shield then got another brown wash on top to darken the edges and crevices and once that was all dry I took some fresh copper paint and added in random highlights so that there is still some shine to it. The sword was treated the same way. The last thing I did was check the whole thing over for any untidy edges as untidy edges on paintjobs make me crazy. It’s easy to fudge over an imperfection by just back painting the same colors over to clean up the areas where one color meets another. It doesn’t have to be perfect, just enough to maintain the illusion. That’s the end of the paintjob! Next I added in all of the model finishing touches with a mixture of 3 colors of modelling flock and nail flock. Just adding it in all of the little places where the mud has accumulated in the rock, giving an area for moss and grass to grow. All of the grass flock I have is 2mm and this particular model made me wish I had some longer stuff to make tufts with, so that’s definitely now on my wishlist. 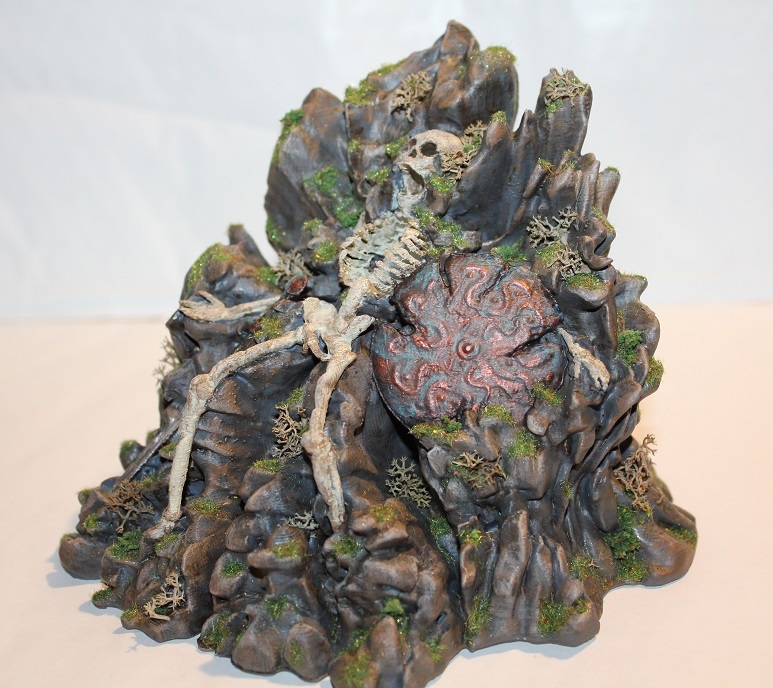 I also added some model clump foliage and brown Lichen to places to mix up the foliage a bit. Most of my modelling materials come from Serious Play Scenics, but there are occasional other things I use, like the fuzzy nail powder which I found on eBay. Click any photos in the gallery below to see larger pictures of The Fallen Warrior from various angles, as well as some progress photos. Now I’ll cover the Winter Wondertown which is available on Cults as a paid model. 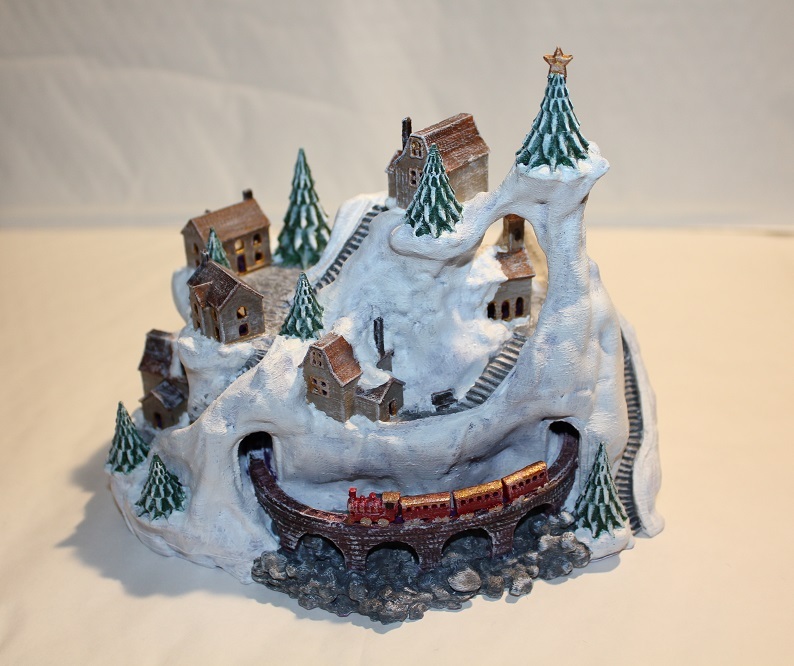 The seeds of this model were planted with a very rough sketch I made involving a train, a tunnel and a house, which Kijai ran with, making the town his own, fleshing it out, then loading it up with adorable details and personal touches. This prints with holes and tunnels on the underside where you can feed LED lighting through into all of the houses which makes this beautiful model into a slightly more festive, lit decoration. The only problem that we had with the printing of it was that our printer did not want to do the street lamps properly. In the end we only ended up with 1 of the 4 lamps upstanding and then I accidently snapped it off anyway… My plan is to eventually reprint the lamps and add them in, but I painted the model without them for now. I’d also like to note that many people have printed this model and have had no trouble with the lamps which means the issue is with our printer and not with the STL. So we printed this in purple, because we had a lot of purple filament. And it ended up being sort of a happy accident, because after I primed it with a thin layer of white acrylic, the purple showed through in the shadowy places doing the shading for me! I honestly thought this one was going to be an absolute beast to paint because it is so large and (unusual for us) we printed it full scale, however there is so much snow that it was actually a lot easier than I’d anticipated. I blocked in the base colors all over and then commenced to applying the washes, followed by the highlights as I do with all of my models…. then back to washes… followed by more highlights. So. Many. Layers. I’d considered flocking this with snow fluff the way I did with my festive moon city, but instead I left it unflocked. Partially because I’ve lost my white snowy flocking powder, but also because I wanted to preserve the shading that the underlying purple plastic provided. I trimmed all of the windows in gold as well as parts of the train and the star on the highest tree to add in the metallic finishing touches I enjoy so much. I also added a bit of metallic black to the steps and pavements to give them an icy twinkle, but that didn’t really translate to the photographs. We don’t have any suitable LED’s to feed into the houses at the moment to light it up, but when we get around to it I’ll update the photos! Click any photos in the gallery below to see larger pictures of the Winter Wondertown from various angles..
Lastly I’ll cover the Red Panda Tree which is a very simple model, but it’s squeegasmic and functional as well! I think that this sleeping panda is a really good example of what a 3D print can become with a bit of paint, fluff and imagination! The first time Kijai sent me a picture of this model as a monochromatic render, I knew exactly what it was without an explanation and I couldn’t wait to get a hold of my own copy to embellish. As this is also a pen/pencil/paintbrush holder, we printed it full scale. I primed the plastic as usual with a thin layer of watered down acrylic paint, then allowed that to dry overnight while I brainstormed what I could do to it that wasn’t just a simple paintjob. 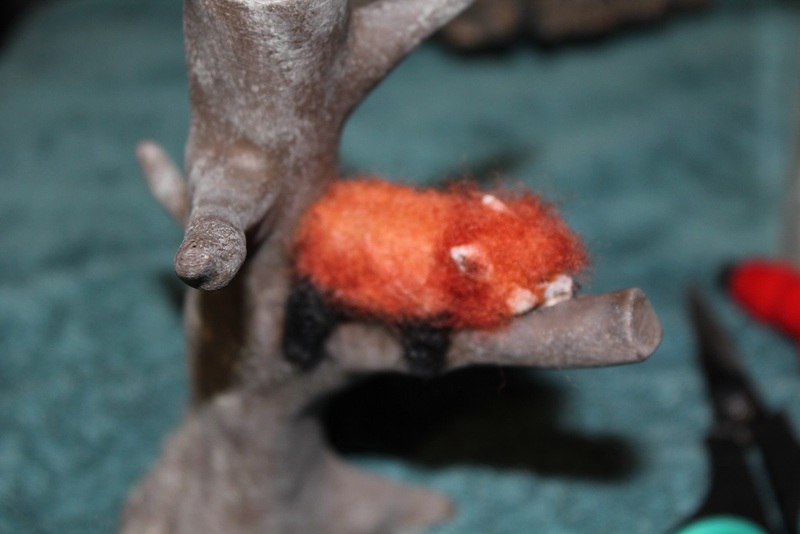 Lately I’ve been watching some tutorials on youtube that involve wool roving to polymer clay sculpted creatures and I thought, I have the wool roving… in red panda colors… I could give it a shot! 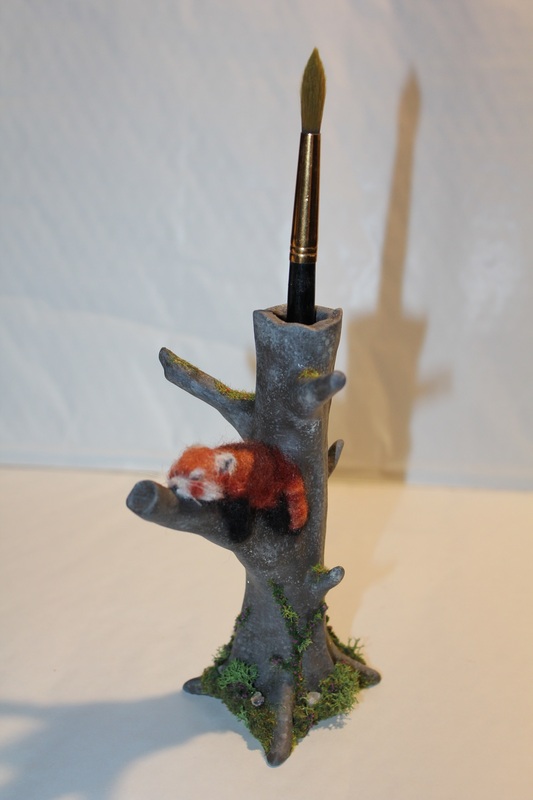 To give myself a template to work from and provide and underlying color, which is essential when adding fur or flocking fluff to anything, I blocked in the colors on the panda and painted the tree a dull brown. After that was all dry I used a sponge and some beige paint to give the tree a bit of personality. Then I set to work on the panda. It took me a day and a half, but I managed to make him fuzzy! In sections, I used a combination of pva and superglue to get the fluff stuck down, allowed it to dry fluffy, and then trimmed it all back once dried. He’s not perfect, but I’m really happy with my first attempt at this technique. The last thing I did was apply the foliage and pebbles at the bottom of the tree. I figured that the tree is clearly dead, but that doesn’t mean that there can’t be other things growing from the ground up! Materials used for the base of the tree are flocking powder, static grass, clump foliage (with tiny purple flowers), lichen and quartz pebbles. Click any photos in the gallery below to see larger pictures of The Tree Panda from various angles, as well as some progress photos. Well that’s all for now. I hope that as I keep publishing photos of my finished models it will inspire more people to take their prints to the next level.